Bitter End, for me, was a little hard to read. I didn't think it would be so raw and evil as it was. I was bothered by a lot of things that happened to Alex, but this is what made the story very believable. It's girl meets boy, boy and girl fall madly in love, then boy gets a little to controlling. Things like this happen almost every day. Lot's of women get trapped in a relationship where they are constantly beaten, verbally abused, and mentally abused. It's sad, but it does happen. Not just to grown woman, but to young teens as well. And that's exactly what happens to Alex. She never expected to fall in love with Cole. Things were amazing in the beginning and she was riding high in the clouds full of love. Of course the more she got to know Cole and the more time she spent with him she started seeing his true side. He was CRAZY! Cole accused her of doing things behind his back, not loving him enough, lying to him all the time, I mean the list goes on. Out of fear, Alex had no idea what to do. One minute he would hit her, the next he would say sorry and be NORMAL Cole for a while. She fell for every word he fed her. Alex was truly confused and because of it she slowly began to shut people out. She loved Cole, but knew deep down she shouldn't allow him to do these things to her. This could be anyone's child or friend. Even though it was a little hard to read, emotional wise, I am happy I read it. 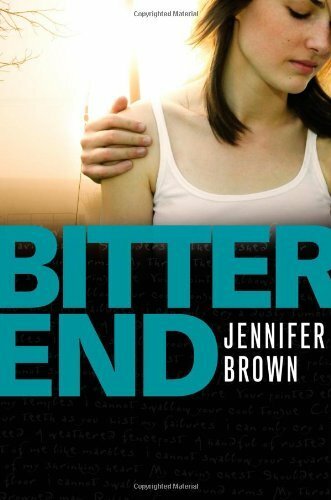 I think all teens and adults should read Bitter End. It's a fiction, but a reality at the same time. I've never been through something like this, but it was very easy for me to put myself in Alex's shoes. Jennifer Brown did a really good job describing certain scenes, that it wasn't hard to have a clear picture in my head. This one was a book that I just couldn't finish. I know the topic was suppose to be powerful but for me I didn't even feel the connection between Alex and Cole, because of the lack of connection I knew I wouldn't care very much when they fell apart. I feel like it wasn't going to be heartbreaking for me because I didn't see that Alex and Cole "loved" each other. The whole thing felt very forced to me. Really? I didn't get that feeling, but I did have a hard time understanding how after the third time she still stayed. I really enjoyed this book, too. Although, I think "enjoyed" might be the wrong word. I think it takes guts to stay with someone that abusive, especially if it's someone you love.. This sounds like a really emotional read. But necessary. Thanks for the wonderful review!